I love how smooth the new Velo Orange sealed bottom bracket is. Finally riding again, the past week or so, recovered from February's crash. I decided to recheck the crank-to-spindle mounting bolts after a ride or two. Yup, needed a further tightening. Then again after the next ride. And the next (my usual local ride is 18 miles). So, after 7-10 rides, needs it every time, and I suspect again today. Now, it's no more than 1/8th turn or even less each time. This is new to me, never had such a problem before. So, either (a) I have a spindle-taper issues, somewhere I could possibly look up what taper 1980 Avocet cranks have or (b) the bolts (using the ones supplied with the bottom bracket) are backing out. I am tempted to do something I do not recall ever needed to do on any crankset -- put threadlocker on those bolts. Hmm, that would help if it's (b) but if it's (a) it's going to be hard to diagnose once the thread locker is on. Perhaps there is a (c) that has not yet occurred to me. Yes, tapered power-transfer designs behave funny. Remove the cranks, reinstall them with a slight wipe of oil on the tapers, and tighten to 30ish foot pounds (40ish NM). Ride for a few miles, re-tighten, and then leave them alone. You certainly may use loctite the second time you re-tighten, but if they work loose (creaking or knocking), the taper is already shot, and the cranks are NG. This assumes you know the history of the crank, and that the tapers that you have used with it match. Put some beeswax on the threads and it acts a bit like loctite but easier to remove. Will do, have a torque wrench handy. , but if they work loose (creaking or knocking), the taper is already shot, and the cranks are NG. This assumes you know the history of the crank, and that the tapers that you have used with it match. No idea on the Avocet cranks, because (a) info on Avocet stuff isn't as ubiquitous as some other brands, and (b) I have not looked. As for knowing the history, I suspect when I bought the bike on eBay in 1998 the cranks had never been off. I have twice, once in 2017 when I started riding again, and again over the winter to install the VO bottom bracket. I have recently had this problem with two different cranks, both older cranks that were new to me. The tapers look fine. I should say they looked fine before I installed. Both cranks worked loose on the first long ride, and I had to tighten them occasionally just as Larry mentioned. Please don't tell me the taper is shot. These are older cranks, no longer made, and I mean to make them work as long as I can. In both cases, repeated tightening seems to have done the trick for now, but I am prepared to tighten them again if that's what it takes. Nonetheless, and this is not a rhetorical question: what can possibly go wrong? Seems to me the possibilities are (1) no amount of tightening fixes the problem (either the crank arm eventually bottoms out and can't be tightened anymore, or the crank splits apart at the tapers or (2) we reach a point where the crank arm is permanently pressed onto the spindle and cannot be removed again without serious damage. What else? On the question of Loctite, I would not think the bolt is coming unscrewed. I sure wouldn't put Loctite on the taper itself! I have never tried but I wonder if a film of JB Weld was used and allowed to COMPLETELY dry would work? Stop retighten the cranks or you will ruin them. The bolts are not loosening, the crank arms are working their way further up the spindle. If you tried to pull the cranks off you will find they are on really tight. I have recently had this problem with two different cranks, both older cranks that were new to me. I wonder what brand/model cranks? Perhaps some are prone, some others immune? Yeah, I meant on the threads. Stop retighten the cranks or you will ruin them. The bolts are not loosening, the crank arms are working their way further up the spindle. I am beginning to suspect THIS. Gonna Loctite (capitalized as otherwise the spellchecker keeps trying to change it to "lactate", not going to try that on my cranks ) the bolts and hope for the best. 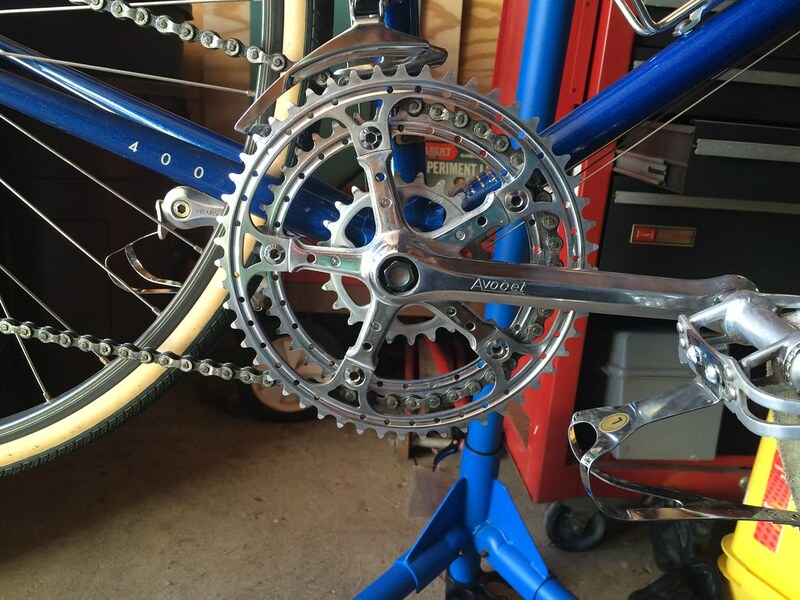 If the crank arms deteriorate, I might be shopping for some Campy cranks as most of the rest of the bike is Campy. I happen to have an extra set of Stronglight 93's... but on an Italian bike??? Perhaps Avocet cranks are just soft? NEVER had this before on any cranks -- my own, friends' or the 100's I worked on in my bike-shop days; not even Maxy cranks which I always presumed where made of alumibutter. Plus I should also check w/VO on the taper type on their bottom brackets. Cranks were ridden loose and started to distort? I have never re-tightened cranks. Sometimes, when removing, I find the bolts need surprisingly little force. I have also never experienced any play in my cranks. I used Avocet cranks for 2 or 3 years BITD. They are rebadged Ofmega CX cranks. While they were nominally campy interchangeable, IIRC, the tapers are somewhat on the small side. Sheldon Brown mentions this somewhere, but exaggerates (IMHO). ISO and JIS spindle standards didn't really exist then, I'd still guess they'd be a much better fit on an ISO BB. I think I used one with an Avocet BB for a time, then moved it to a Zeus, which also have a smallish taper. Both worked no problem. How far does the end of the spindle extend into the crankarms now, with the bolt taken off? I don't know what alloy they used but it wasn't soft. Presumably 6061. Sometimes I'll snug up a crank after the first ride just to check, once. If a crank has to be tightened repeatedly, something is seriously wrong. If cranks have been ridden loose for a while, it generally ruins them. Last edited by Salamandrine; 04-12-19 at 03:53 PM. Do not rule out the possibility that the bolt is loosening. I had that happen on a Campagnolo Nuovo Record spindle, of all things. It would work itself loose within two miles! Like everyone here I thought it was loosening because I had damaged the drive side arm, but I saw no sign of wear on the spindle or the arm. I finally figured it out and replaced the BB with a Phil, using the original NR crankarms, and it has not budged since. Sheldon taught me to mount the cranks, ride the bike around the block a few times, retighten, and don't touch 'em again. That sounds like a wise idea. Did they ever need that, in your experience? Thinking about it, since riding around the block is something I generally do several times during a build, as well as checking the most important bolts (stem / seatpost / cranks / chainrings) before considering it done, I may actually have followed Sheldon's advice more often than not. Well, they always tighten a little more. So ... I guess.?. I have found that the 8mm Allen bolt type crank bolt is prone to stretching. You could use the type with a hex bolt and use a socket to tighten it. In my experience they will hold better. Last edited by BoozyMcliverRot; 04-12-19 at 04:18 PM. Tapered cranks rock slightly as you pedal. In that rocking, they slide slightly inboard. 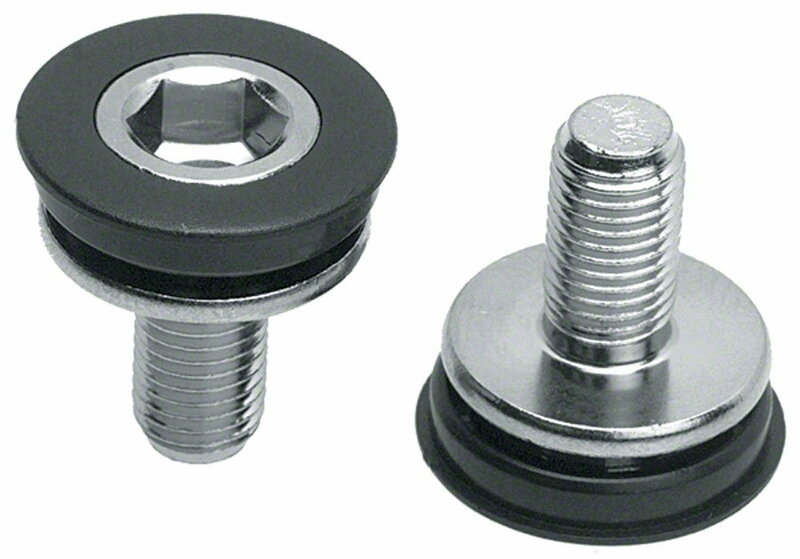 This means that a properly torqued bolt can always be tightened further after you have ridden. Do this and the crank slips further onto the spindle. Now think about what is happening to your crank as you do this. Every time you re-tighten and ride again, you drive the wedge of the spindle a little further into the tapered hole in the crank. What happens when you drive a wedge into something far enough? That something breaks. Mankind had been using wedges to create cracks and splits for many thousands of years. With a hard enough wedge and enough movement of that wedge, the part always breaks. Listen to Sheldon. Ride once around the block, re-tighten - and stop there! Tapered cranks rock slightly as you pedal. In that rocking, they slide slightly inboard. What came with the BB is 14MM hex bolt. Not the world's biggest mating surface on the flange under the head of the bolt, maybe needs a washer to spread the "load" over more of the face of the hole in the crank (hard to describe). Interesting question. I just took off the RH bolt, looked inside; more space in there than I suspected. The crank arm would have to move inboard 7mm-8mm before the spindle end was flush with the crank arm's bolt-mounting surface. Another data point - on yesterday's ride, for the 1st time in a while, I had an overshift where going to the outer chainring the chain went off the outside of the outer chainring. Coincidence? Or not? Maybe the crank arm is slowly moving inboard. Sounds like you doubt it, but it's true. Due to friction while mounting, the crank is under strain, and when it squirms around from riding, it slides further up the taper on the spindle to relieve that strain. After a while the forces are in equilibrium, and the bolt will seem looser if you wrench on it. You might want to ask Greg Reiche (pronounced "Rich") of Cycles Hibou, he's the most knowledgeable guy I know about historical spindle tapers and compatibility. There was a very interesting thread on internet-bob mailing list last year titled "BB taper standards and false binaries". The "false binary" is the ISO/JIS one -- the idea that there are only two taper standards is false. On the 1 or 2 that have done this for me, I apply "diminishing returns" if the bolt is not tight but the crank arm seems to be I just snug the bolt down, not fully retorque and monitor to see. If the crank arm stays tight then you could locktite the bolt and call it good while still keeping an eye on it. Also fully agree with Mark on the dust caps, one of their many functions are as a failsafe locknut, they also protect the threads so the puller installs properly to remove the cranks. I think it helps to point out the forces at play. There's the taper (wedge) which wants to push the crank arm outboard. There's the bolt (screw) which wants to pull the crank inboard. Finally there's friction, which is quite high, which wants to resist movement in either direction (crank won't come off without a crank puller). Cranking motion imparts loads on the crank that allow it overcome friction and shift slightly, but without tightening the bolt. There will be a tendency for the crank to move inboard since the force initially provided by the crank bolt is equivalent to the force of the taper plus friction. Eventually the crank creeps towards where it would be without friction, which is inboard of the initial tightening. This means the bolt gets "looser" because what it was pulling against moved, but without unscrewing. At this point, tightening the bolt will preload it and pull the crank inboard more causing it to creep further inwards when it again moves to where it would be without friction. Conversely if you remove the bolt, pedaling action will overcome friction and allow the crank to creep outwards since the taper pushes the crank outboard but there is no bolt to push it inboard. This is also why you're not supposed to tighten crank bolts on cranks already installed. Crank bolt torque is higher than what is is supposed to end up at. Last edited by Kuromori; 04-13-19 at 02:34 PM. When you pedal, you put strong forces on the square taper interface: you're basically rocking the crank arm around on the spindle. If the crank bolt wasn't in place, the crank arm would gradually squirm outboard until it falls off of the spindle. When you first installed the crank arm, the crank bolt was pressed VERY TIGHT against the arm, since it was just used to push the arm up onto the taper. But as you cause the arm to squirm on the spindle under your pedaling forces, it budges against the crank bolt, causing it to ride inboard up the taper. It will keep moving inboard until its contact with the bolt is soft enough that squirming doesn't budge it inboard anymore. This process happens every time you re-install a crank arm onto a spindle, and every time you re-tighten a crank bolt. It permanently widens the taper on the crank arm, and after enough cycles this will destroy the crank arm. 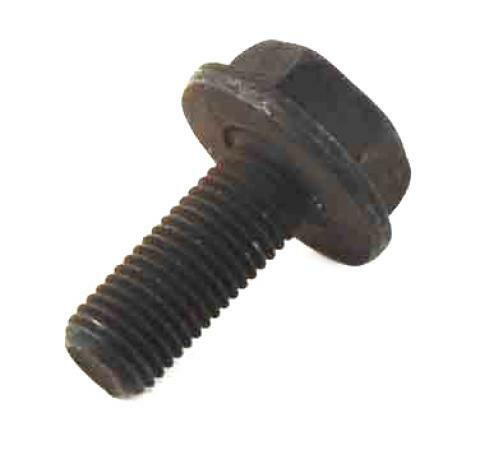 Because the crank arm crawls away from the bolt, the bolt feels like it's tightened less strongly against the arm, even though the bolt didn't actually back off. You can check whether the bolt is actually loosening by drawing a line on the head so that you can see if it has rotated since you last looked at it.